Mega Man Xtreme contains the same gameplay as its home console counterparts. An action-platform game, the player must attempt a series of stages, gain various power-ups such as armor parts, and defeat each stage's boss, assimilating its signature weapon. The game features stages, enemies, and bosses from both Mega Man X and Mega Man X2 for the SNES. 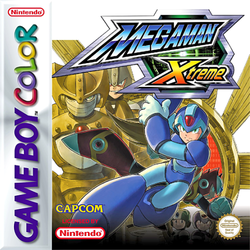 The game was followed by one direct sequel, Mega Man Xtreme 2, also for the Game Boy Color. In 2013, Mega Man Xtreme was made available on the 3DS Virtual Console of Japan's Nintendo eShop for the Nintendo 3DS. It was later released in the North American eShop in 2014. Mega Man Xtreme takes place within the Mega Man X series timeline, during the 22nd century in which humans and intelligent androids called "Reploids" coexist. Daily life is under constant threat by "Mavericks", Reploids that have turned to a life of crime. The series follows the exploits of Mega Man X and his partner Zero, a pair of "Maverick Hunters" led by the benevolent Dr. Cain. This police force has been responsible for suppressing the threat of robotic, criminal activity, particularly that of a dangerous Maverick leader named Sigma. Within the continuity of the Mega Man X series, Mega Man Xtreme takes place between Mega Man X2 and Mega Man X3. This page was last edited on 1 April 2015, at 18:23.